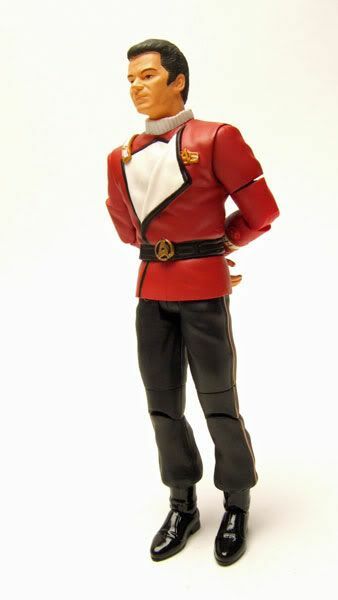 Diamond Select released this Kirk as part of a special carded "Death Of Spock" Gift Set in their Star Trek II The Wrath Of Khan line. 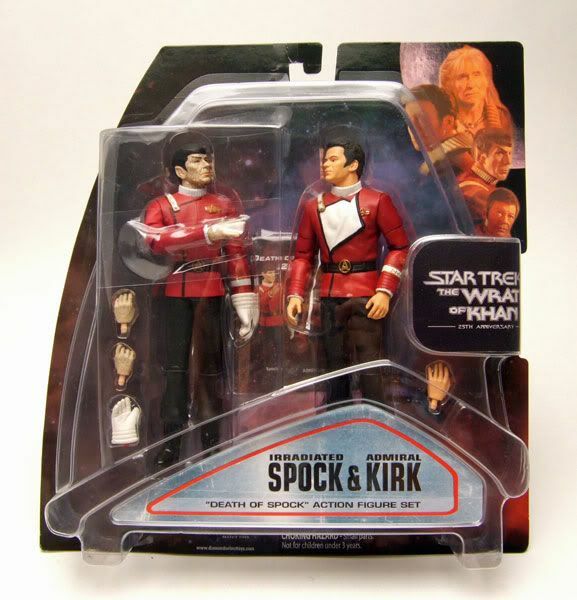 The Rundown: To get a little more mileage out of a couple of their figures, DST threw Kirk and Spock together, changed the figures up a bit, added some gloves...and voila, the "Death Of Spock" 2 pack was born! Today, we'll focus on the Kirk figure. The sculpt on the figure is the same as the single carded "Doube Cross" Kirk. He's got the regular TWOK Kirk head...which I'm not that big of a fan of. 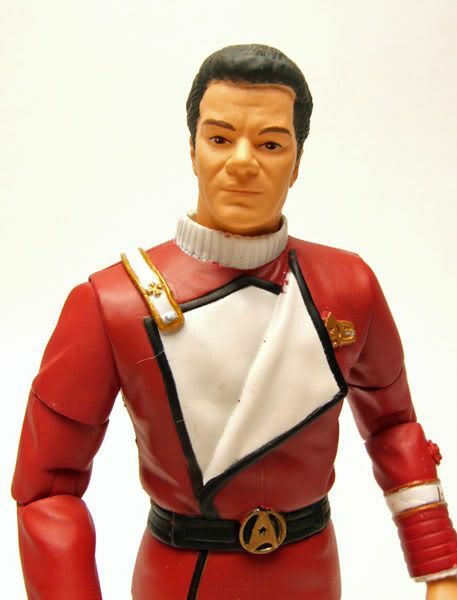 I know Shatner's likeness is tough to nail, but the head on this figure looks a little rough even by those standards. It looks more like a Shatner lookalike from a convention or something. The sculpt seems kinda 'pinched' in. 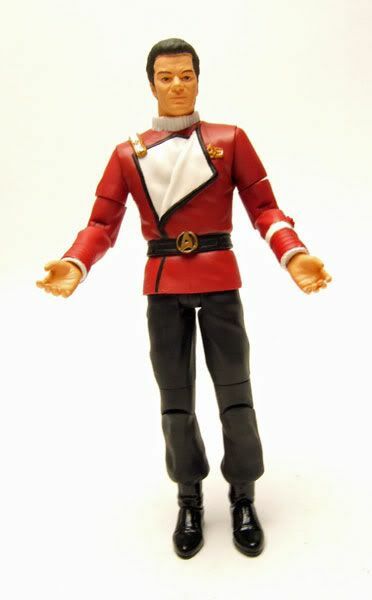 I think Diamond did a far better job on the likeness in the 'Star Trek The Motion Picture' 2 pack. The body is the same, except no more blood splatter on the white part of the tunic. 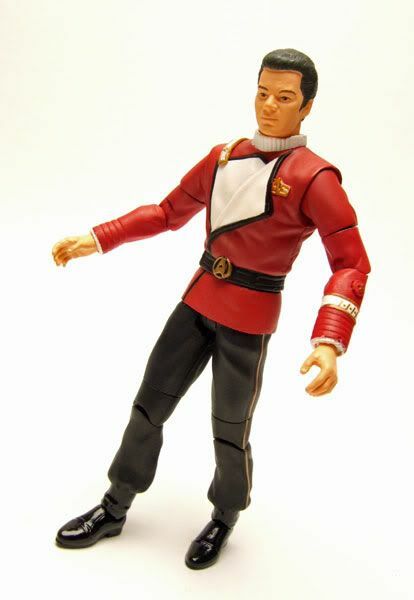 Looks pretty sweet, but allot of folks (myself included) had already repainted a "Double Cross" Kirk, so this figure wasn't that much of a treat... If you hadn't though, at least it was enough of a change to make it kinda feel like a new figure. The articulation is the same here as on the other TWOK figures....meaning you get a decent amount without trashing the sculpt. 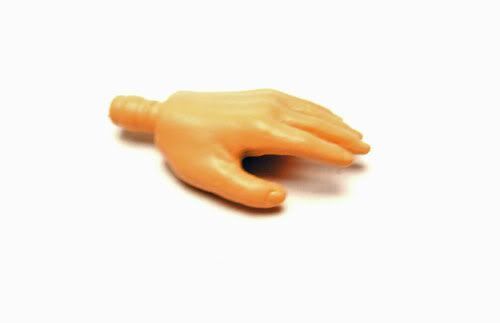 Accessories: A hand. That's it. I know that Kirk didn't really use anything in this scene, but it would have been nice to at least have a phaser or something thrown in... oh well.